Did the Guardian once again cave to intimidation from ‘the lobby’? 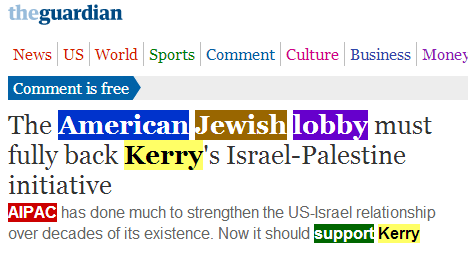 We recently learned that the Guardian changed the headline to a Feb. 26 ‘Comment is Free’ op-ed by Alan Elsner, of the far-left group J Street, arguing that the pro-Israel lobbying group AIPAC should do more to back John Kerry’s efforts to promote a two state solution. There is no footnote or editor’s note on the page to indicate why they made the change, but – in the view of many faithful Guardian Left readers – they may have tried to ‘avert charges of antisemitism‘ and thus, in effect, caved to intimidation from the Jewish lobby Israel lobby CiF Watch. Finally, in case anyone thinks our characterization of J Street as “far-left” is unfair, you may want to watch the following clip of attendees at the group’s 2011 national conference telling us how they really feel about Israel, the Palestinians, Hamas and the greatest impediments to peace in the Middle East. J-Street proves that people are gullible. It’s become a relatively new tactic to draw support for something by calling it what it isn’t. Other examples: the New Israel Fund, the Marjorie Stoneman Douglas Everglades Forever Act (she wrote to the Governor of Florida to have her name disassociated with it). What’s interesting is that the Left has a ho-hum attitude about it, but they would vociferously rant if others were to start an organization called “Support Palestine” or something like that which would aid terrorism victims. The big question re Silverstein is if he actualy believe he is commiting a Mitzvah or is he aware he is using a cheap trick to exploit the term? Your giving him too much credit. Thanks for the video. The interviewees lived up to all my expectations (I’m sorry to say), and the sound track was perfect.